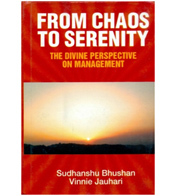 "From Chaos to Serenity: The Divine Perspective on Management," intends to redefine paradigms of Business Management incorporating spiritual and philosophical dimensions of life and deeper understanding of human existence from wisdom of ancient cultures of the world. It is an attempt to provide a new perspective – 'The spiritual/divine perspective' to modern day business. Ancient wisdom from Upanishads, Bhagvad Gita, Lao Tzu, Confucius, Buddha, Heracalitus, Plato and Aristotle has been incorporated in modern by scientific rational humanism in this Divine Perspective. Modern day business in management of chaos which leads to stress and burnouts. Both business ideology and business character would and should undergo major change – "A Transformation from Chaos to Serenity." The magical alchemy for this transformation will emerge from a unique blend of and the Culture of Discipline and the Entrepreneurial Ethics. These two can only be incorporated by invoking spiritual dimensions in human life. For spirituality is the real essence of human existence. Business can only move towards sanity and serenity. If Divinity – the real power of human existence and Cosmic Consciousness is involved in management of human affairs. Divinity operates on the principle- Every thing is god. Everywhere is God, see God in every slef and you will learn the Art of Management. The book would give insights on new work ethos and management through underpinnings from ancient cultures of the world. How divinity can be incorporated in management? When will it be incorporated in Business? The book provides insights on how Divinity could be incorporated in modern day business to usher in much needed serenity in the minds of the people and world at large by transforming the most powerful institution of modern day world – The Business. Management concepts on motivation, leadership, organizational dynamics, organizational behaviour, work ethos, Knowledge management strategy, entrepreneurship, business excellence etc.have been redefined in the light of this Divine perspective . The Ethics of Business Management, author believe would provide the Real Sustainable Business Excellence In simple terms for Business Excellence to the sustainable, the model and philosophy has to be rooted in Values and Ethics which are to be derived from wisdom of ancient philosophy and cultures of the world – that would lead us from chaos to serenity- through the operation of divine perspective. Sudhanshu Bhushan is Professor at Vedatya Institute (formerly IIMT), Gurgaon. He has extensive corporate and academics experience in USA, Europe and Asia. A gold medalist in management education, he is widely traveled around the world with mixed experience . He is a mystic, poet, philosopher, management consultant, and academician in right earnest. Sudhanshu has published many papers in diverse subjects ranging from economics, globalization, risk- management, ethics, leadership, retail, and hospitality. He is also an advisor and facilitator for management ethics programs with many NGOs and corporate businesses. He is developing programs in motivation, leadership, organizational behaviour, etc. based on rich cultural heritage of India and other Asian cultures. Sudhanshu is a thought leader on alchemy of western management concepts and oriental thought, leading to management transformation, which is blend of culture of self and organizational discipline and business ethics. He spends his leisure time meditating and praying that Divinity / Spirituality be ushered in management of all human activity on this mother earth for a brighter and stress free world. Vinnie Jauhari Ex. Director, Vedatya Institute (formerly IIMT), Gurgaon. She has been very passionate about her work. She has completed M.Sc. (Hons.) in Electronics from Punjab University, Chandigarh and MBA (Gold Medalist) (Marketing). She received her Ph.D. on corporate Entrepreneurship from Indian Institute of Technology, Delhi and her Post-Doc from the United Nations University, Tokyo in the area of Technology and Society. Dr Jauhari is the Region Lead for India at Open Innovation Office, HP Labs at Hewlett-Packard Corporation. She is also currently Adjunct Professor and earlier the Head of the school of Management and Entrepreneurship at Institute for International Management and Technology (collaboration with Oxford Brookes University). She is also the founding editor of the Journal of services Research (features in EBSCO and PROQUEST databases). She has over hundred publications in National and International Journals and has also authored several books such as Business strategy, Services Management, Readings in Services Management, and Global cases studies on Hospitality Industry. She is a reviewer for numerous international journals. Her areas of interests are Corporate Entrepreneurship, Sustainable Development and Technology issues, She is widely traveled and has been a speaker at numerous International Conferences. She is Involved with numerous international projects on Technology.